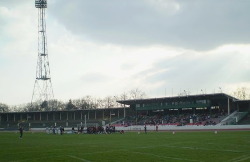 The Crew Wroclaw lost its debut game in the EFAF Cup against the Czech Champion Prague. Prague has shown the polish spectators football on the European level. The game was watched by more than a 1000 spectators who gave an incredible cheer for the home team (0:22, 0:12, 0:12,0:7). Before the game the fans watched and listen to the concert given by Wroclaws rap group named Trzeci Wymiar. The guys made a great intro to the game and the teams could start to play. For The Crew their first game was a great lesson how much they still need to learn and how does football on a European level look like. The defeat hurts, but it wasn't so bad for the first game. Now it 's time to gather experience, think about the mistakes and play the next game better.